If, as certain scientists believe, water remembers: what does the first historian dream? Anthologized in Best American Poetry 2015. Derrick Austin is the author of Trouble the Water (BOA Editions). 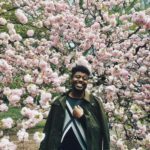 A Cave Canem fellow, his work has appeared in Best American Poetry 2015, Image: A Journal of Arts and Religion, New England Review, Nimrod, and other anthologies and publications. He was a finalist for the 2017 Kate Tufts Discovery Award.